Images on this page are from Hasbro catalogues. 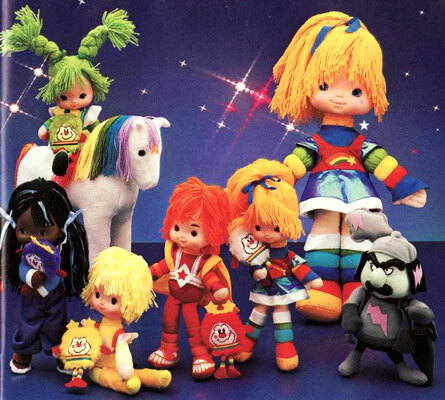 There were nine dolls, three animals and six other creatures produced. 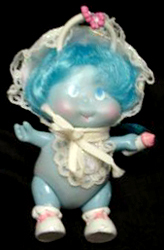 There were five Moondreamer dolls produced. "Meet the Moondreamers! Crystal Starr is the beautiful star-architect and leader of Starry Up. Whimzee, the Dreamscape artiste, operates the Dream Machine and chooses the best dream for each little sleeper. Bucky Buckaroo is a star-ropin', Cloud-punchin', comet-bustin' cowboy! The inventor of the Dream Machine, Sparky Dreamer, is in charge of star production, dream fulfillment, and sky maintenance. Dream Gazer is a mysterious Moondreamer who had great understanding of everything under the stars." 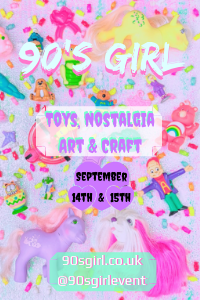 These poseable, 51/2" dolls have unique glow-in-the dark hair! 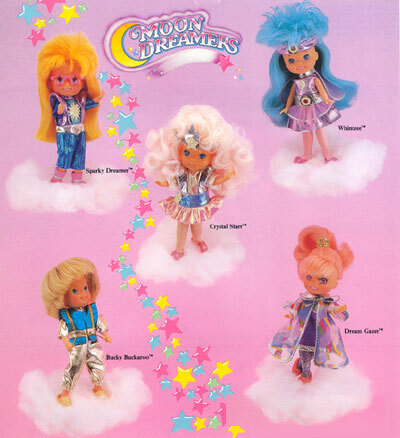 Moondreamers wear sparkling outfits with glow-in-the dark clothing trim, shoes, and star comb! 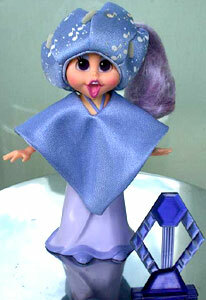 Each Moondreamer comes with a figure stand and a dream crystal necklace for little girls to wear. 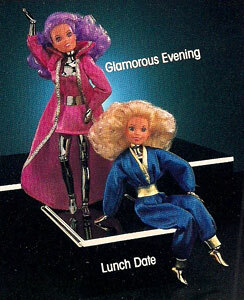 There were two Star Finder dolls produced. 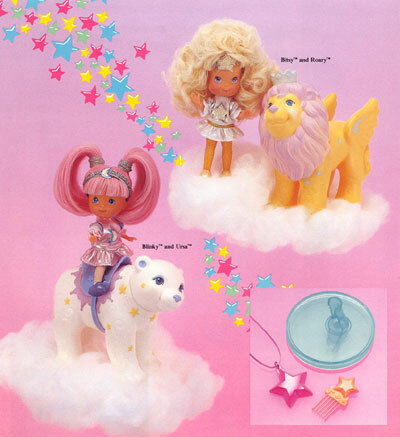 Each came with a pet and various accessories. 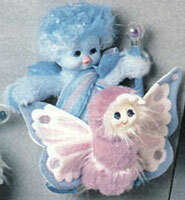 "Bitsy and Blinky are the little Moondreamers who like to ride through the starry skies! Bitsy is shy and hardworking, while her companion, Roary the lion, is outgoing, courageous and a bit of a snob. Blinky loves adventure, and her curiosity often gets her into trouble! Blinky's constant companion is Ursa, a huge, cuddly mother bear." Bitsy and Blinky have unique glow-in-the dark hair! 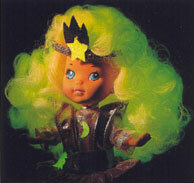 Each doll wears a shining outfit with glow-in-the dark clothing trim, shoes and star comb! Their animal companions have glow features too, and Ursa comes with a removable saddle! Pretty, poseable, 4 1/2" dolls are specially designed to sit on their animal companions without falling off. Each doll comes with a figure stand and a dream crystal necklace for girls to wear. There was one doll and pet produced for the Twilight Team. "When it's time to sleep, Celeste and her magical dragon Galaxia bring on the night! Adventurous Celeste and adorable, but shy, Galaxia tow the moon in place and pull the starry night across the sky. 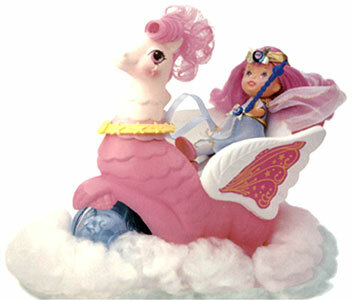 Celeste and another Moondreamer friend can ride through the twinkling sky on graceful Galaxia." Celeste and Galaxia have unique, glow-in-the-dark hair! 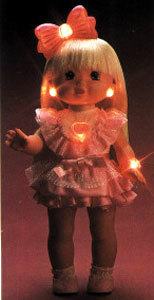 Poseable 5 1/2" Celeste wears a pretty sparkling outfit with glow-in-the-dark clothing and hairpick. Galaxia has glow-in-the-dark features, too! 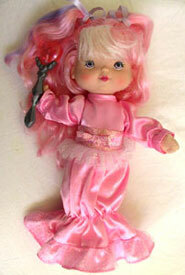 Includes glowing necklace, ribbon reins and barrettes to style their hair, figure stand and magic wand. There were three Snoozers produced. "The Snoozers, the Moondreamers' helpers, are loveable friends who soothe little dreamers to sleep. Dozer hushes any "bumps" in the night with his earmuffs, Stardust gently sprinkles sleepy stardust from his bucket into children's eyes and Stumbles softens bright lights with his sunglasses." Snoozers have dazzling glow-in-the-dark decorations on their eyes! 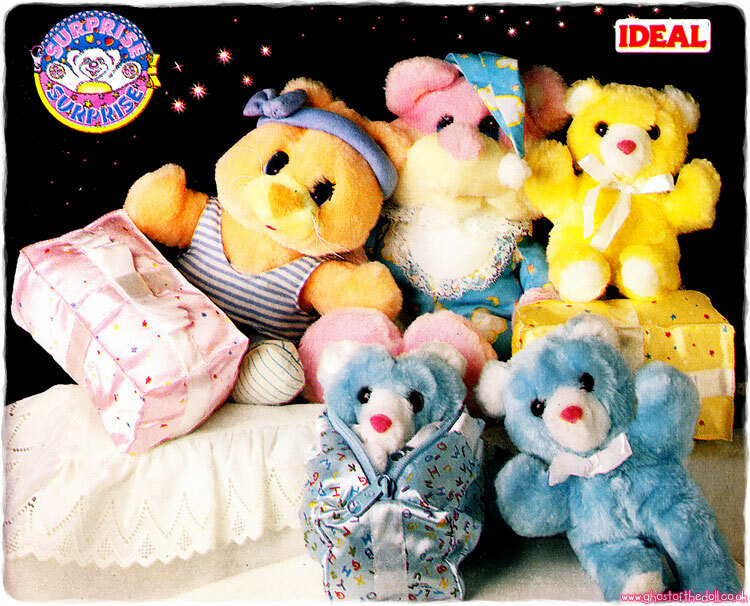 Poseable pals ear soft, fuzzy "pajamas". Dozer (left) wears removable earmuffs, and carries and magic wand. Stumbles (middle) features a removable hat and sunglasses. 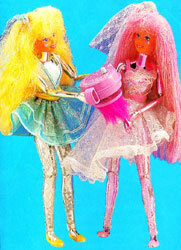 Stardust (right) has a removable cape and bucket of stardust. "The mean dream queen from Monstrous Middle, Evil Scowlene has never slept a wink in her life! She is always trying to steal the stuff that happy dreams are made of and make everyone as cranky as she is! With the help of the Sleep Creeps, she tries to keep everyone awake at night with loud noises and her bad dream crystals." Evil Scowlene features unique glow-in-the-dark clothing trim and hairpick! Includes a Yawny for her hair, a little creature that pinches her awake! 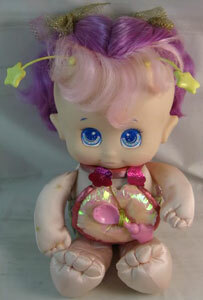 Poseable 8" doll comes with a figure stand and a bad dream crystal necklace. There were three Sleep Creeps produced. "The Sleep Creeps are Evil Scowlene's helpers and the creatures that go bump in the night! Shiner wakes children with his bright flashlight, Creaky fills the night with creaky groans from his big shoes and Squawker makes loud noises with her megaphone. Most of all, they love to make mischief!" Each poseable Sleep Creep has a soft fuzzy body and a spinning propellor. Sleep Creeps have bright, glow-in-the-dark decorations on their eyes. Squawker (middle) carries a removable megaphone.